27th July 2016: Maxol, Ireland’s leading forecourt and convenience retailer today announced its support for the company’s charity partner this bank holiday weekend. The initiative will see Maxol donate 10 cent to Aware from each cup of Moreish coffee and tea sold from Friday 29th July until Sunday 31st July. 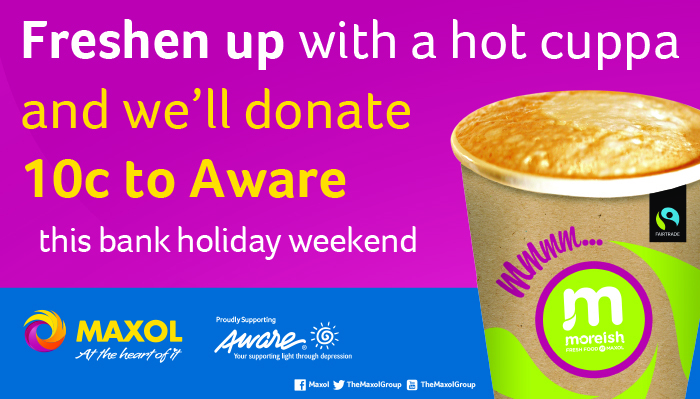 Maxol is calling on customers to support Aware this weekend. The charity aims to promote positive mental health in communities nationwide. It is also helping to support the important issue of youth mental health through Aware’s ‘Beat the Blues’ schools programme for teenagers aged 15-18. The charity partnership will run until at least the end of 2017. It will support the range and level of important services delivered by Aware in the Republic of Ireland and Aware NI in Northern Ireland.